We serve this on our oatmeal pancakes and French toast. Homegrown peaches may be substituted. In a large mixing bowl, add all dry ingredients. Mix well. In another bowl, beat the eggs and stir in buttermilk and butter. Combine wet and dry ingredients and stir well. Let mixture rest while you heat the griddle. Add a little more milk to the batter if too dry. Use cooking spray to prevent sticking. Pour out batter by the1⁄2 cup. 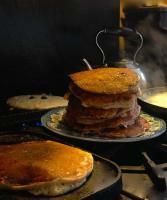 Pancakes are generally ready to turn when they first begin to bubble and stiffen on top. For light, fluffy pancakes, refrain from flipping more than once. Add blueberries after pouring onto griddle if you’d like. Heat maple syrup and garnish with gingered bananas.